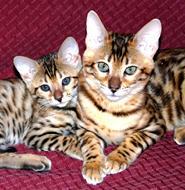 Santa Fe Bengal Cattery - About our Cattery: New Mexico Bengal Breeder of SBT & Foundation Bengals. Santa Fe Bengal Cattery is located in Northern New Mexico... find out more about us! with leopard rosettes, glittered pelts and sparkling personalities. but we put our "all" into everything that we do for them. TICA requests that we put this disclaimer, when using their logo: "This cattery has not been inspected by and is not endorsed by The International Cat Association, Inc." On the other hand... Our Cattery HAS BEEN INSPECTED by our FELINE SPECIALIST VETERINARIAN and we are in the process of becoming an "OUTSTANDING CATTERY" with TICA. Prima (F1), Baby (F2), and Bodacious Belle (SBT) happily napping. Bengals Illustrated, TIBCS, and TICA "Code of Ethics" and "OUTSTANDING" TICA Catteries do more for their Cats, have better habitat conditions, strict high-level Cattery policies and therefore, higher quality, happier, healthier Bengal Cats. At Santa Fe Bengal Cattery we have signed and adhere to the BENGALS ILLSUTRATED, TIBCS, and TICA "Code of Ethics" and are currently in the process of being a TICA "OUTSTANDING CATTERY". There are hundreds of Catteries and very few OUTSTANDING Catteries. Look for us soon on the TICA "OUTSTANDING CATTERY" list on the Official TICA web site. We, of course, do the simple basics, like: Vaccinating our Kittens, providing the TICA Kitten Registration and parent TICA ID, have Kitten Vet Health Inspections, we have a genetic defect Health Guarantee, PLUS provide life-time Information and Educational support to our Kitten Buyers... and, of course, one of the most important basics... We give all of our Kittens and Cats lots of love and attention! Check out our Testimonials page! Scroll down to find out just how much more we do at Santa Fe Bengal Cattery and to view more great photos!! Santa Fe Bengal Cattery is a proud member of Bengals Illustrated Reprutable Breeder Program and The International Cat Association and we are listed as a premiere Cattery on the Bengals Illustrated and TICA web sites. We are as well a proud member of The International Bengal Cat Society, TIBCS, and follow all three organizations "Code of Ethics" for Outstanding Catteries. At Santa Fe Bengal Cattery our cats' happiness and health always comes first. In fact... we play Native American flute music and classical music, that is specially re-composed just for Cats, for our Cats in their Habitats for their comfort and contentment! Our superb large, ultra-clean habitats, our championship blood lines, and the all extras, like music, are just some of the many reasons why we are so well-known for our "DISTINCTIVE LAP LEOPARDS". We work hard at breeding healthy, happy, beautiful Bengals! Click HERE to find out more about our Cattery Philosophy and Mission Statement. Santa Fe Bengal Cattery far exceeds the minimum requirements and conditions for our Cats' Habitats. Click HERE for a description of what our Cattery is like. Santa Fe Bengal Cattery breeds Bengals with strongly Rosetted (BST) Leopard coloring and Snow Leopard coloring, including both Seal Mink Snow Leopard and the rare Seal Sepia Snow coloring. All of our Cat and Kittens have high contrast in the background coloring, breed-standard, or better, attributes in conformation, and a tight, short pelt. We also breed for "Cat-titude" and Personality. Our Cats' lineage is from Championship bloodlines like OS CH Millwood Italian Filigree, RW QGC Dicaprio of Star Bengal, and also has connections to RW Supreme Grand Champion Calcatta's Custom Made (click HERE to see his photos! ), as well as many others... take a look at the list on the STUDS page. It takes a proper comfortable, clean, and interesting-to-a-Bengal habitat, as well as lots of human interaction, to foster a Kitten who will grow to be a unique, personable, loving companion. Our Cats are loved! It has always been a dream to raise Cats and we do this achieving the highest degree of comfort, contentment, health, and happiness for our felines. Our Studs and 'in-heat' Queens reside in highly maintained, heated/cooled Houses with safe constant access to large outdoor play-area habitats. Inside, and out side, our Cats have appealing and comfortable maple-look linoleum as their floor - their feet DO NOT touch microbe-infested dirt! It is easy to keep very clean and free of bacteria and other microbes, plus it is pleasant for them to lay on and kind to their pelts. And, of course, they have lots of toys, including Cat Exercise Wheels, and hours of human interaction daily. See our beautiful Bengals on our PHOTO GALLERY SBT CATS 1 page, PHOTO GALLERY SBT CATS 2 page, PHOTO GALLERY SBT KITTENS page, and the all new PHOTO GALLERY FOUNDATIONS page. The Breeder, and how they treat their Cats, really makes a difference in the quality, temperament, and personality of a Cat. You can buy a Bengal, but to get a "Distinctive Lap Leopard," you have to acquire a Bengal from Santa Fe Bengal Cattery. Our Kittens and Cats are raised to know how to be part of the family. Socialization is a very important process that helps to promote the exceptional and desirable Bengal personality traits. We give all of our cats the initial love and "pre-school" teaching to ensure that they are better than most. Their exotic looks will thrill you and their intelligence, and "problem-solving" skills, will delight you! Just check out our Testimonials Page to see what our Kitten Buyers have to say our Kittens! At Santa Fe Bengal Cattery, we are always interested in what is best for our Bengals. of "Wellness CORE" grain-free formula canned food mixed with freshly cooked and shredded chicken with added "Kitty Bloom VM900 plus 3 Supplement", Taurine, Calcium, and Kitty Bloom Probiotics, which creates the perfect food source for our breeding Queens, Studs and retirees. For our Foundations, they usually prefer freshly ground: Organic/Natural Beef, Turkey with Bone, Beef Heart, plus added "Kitty Bloom" Supplements or the cooked mixture noted above. Most of our Bengals enjoy having the "Wellness CORE" grain-free dried food for in between meal snacks. Our prefered treats are "Cat-Man-Doo" Bonita, Salmon, and Chicken. We also use only non-clay, Premium Pine Pellet Litter, by "Domaine Felidae". All of the aforementioned highlighted products are the best that we have found on the market for top-quality feline care. Our Bengals' excellent health and happiness is what makes us happy! For better feline health, place your order today! a supply of Kitty Bloom supplements, and a sample of food. And, remember the Domaine Felidae store has everything else that you will want and need for you new Bengal Kitten! Click HERE to read our informative letter for SBT Kittens and HERE for Foundation Kittens. to assist with questions regarding their new feline friend. provide New Owners with the best Bengal Kittens. Currently, we are moving towards breeding closer to the original first Domestic Bengal and will soon have true SBT F4 Bengals as our usual SBT's, rather than the "F4 or later" (F10, F20, who knows...) Bengal. Are F4's (Filial Generation 4) better? Yes, they are! We adore our Foundation Bengals (F1, F2, and F3) and look forward to providing the very special original fully domestic F4 SBT Bengals to our Kitten Buyers. Watch for the coming litters! And click HERE to read TICA's (The International Cat Society) Breeders' Code of Ethics. Check our "TESTIMONIALS" page to hear what our Kitten Buyers have to say about our Bengals and about our Cattery. Keep reading and scrolling... for more valuable information and great photos. We put a tremendous amount of effort in maintaining our Cats and Kittens Superb Health and we guarantee their Good Health! All of our Kittens leave for their new homes with their claws clipped, de-wormed, and vaccinated for Distemper (Panleukopenia) and "Kitty Cold" complex with Merial modified-live virus vaccine, as recommended by our Feline Specialist Veterinarian. And we vaccinate in the updated, most current Veterinarian-protocol vaccination location to make sure that our Kittens have the best chance at a happy, healthy, long life with their new Owners. All of our Cats have tested negative for FeLV/FIV and we will be adding the new, safer, avian-based FeLV/FIV vaccine to our vaccination schedule, when it becomes available to us. All of our Cats have also tested negative for all protozoa using PCR, Colonic Flush, and Floation testing methods. Plus, they have tested genetic lineages that are free of HCM and PKD. Our SBT Bengals enjoy their freshly cooked Natural or Organic chicken thighs with Kitty Bloom supplements as listed above, along with "Wellness CORE" grain-free canned, which is added to their homemade chicken Cat food mixture. They also enjoy "Wellness CORE" grain-free dry food, and like treats of Bonita, Salmon, and Chicken by "Cat-Man-Doo". Starting at about five weeks of age, our Kittens are fed "Wellness CORE" Kitten formula canned food and "Wellness CORE" grain-free Kitten dry food, as well as cooked chicken with "Kitty Bloom Supplements". At Santa Fe Bengal Cattery, we feel a responsibility to feed our Cats only the best possible food available to be able to produce the best possible Bengals. Our pet SBT Bengal owners should continue with a high-quality diet of wet and dry food and we use and recommend "Wellness CORE" brand in the grain-free formulas. For our Foundation Cat owners, they may continue feeding the raw or cooked diet, but do have the option of feeding the store-bought canned food, depending on their Bengals' preferences. My parents and I, petting "Cooper"
Why do I breed Bengal Cats? I have always had a natural love and understanding of felines. It started at a very young age and I brought home my first Cat, in need of a home, at the age of 4. Then, when I was 9, my family began being involved in assisting in caring for and re-locating big Cats. 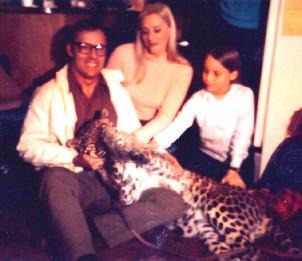 In the photo to the left, my parents and I are playing with and petting a leopard, named Cooper. I helped to bottle feed Lion Cubs, Bob Cat Kits, and Ocelots. We went to events/meetings where there were Leopards, Panthers, African Lions, Mountain Lions and other smaller Wild Cats. These experiences changed me forever and I have always needed to be around felines. I maintain that a house is not a home without a Cat. The Bengal Cat is the perfect blend of my love of wild Cats and the need for a domestic feline companion. Cats are loving, understanding, honest, intelligent, and playful - just for the sake of being playful. I have often said that I like Cats better than most people. I don't mind the long and late hours Kittening, nor the extensive cleaning needed to keep Breeding Cats in my home and in their special Casita Habitats. All of them are my companions, breeding Cat and neuter/spayed Cat, my days are filled with spending time with each one. It is all worth it, when one (or eight of them!) snuggle up to me at night, because they choose to be next to me. Or when I receive a thank you email from a new Kitten Owner... it makes me beam with pride that I can breed Bengal Cats to make me happy and to make others happy too... and I am always learning and improving how I keep my Cats, so they are happy as well! 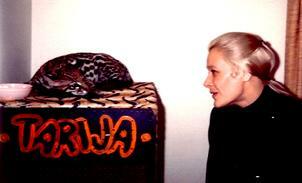 Above is a photo of my Mother and an Ocelot named "Tarija", who I remember very well. Unfortunately, Tarija, like most Wild Cats, didn't really want to be around humans. My Mom is trying to coax the less than happy Cat into not growling... Tarija did like, or rather put up with, one of her Owners and did live with their family for quite some time, until she was placed in an appropriate Wild Life Habitat. Thanks for the card. I can't believe I am one year old already. Even though I am getting bigger (about 12 pounds) my family tells me I still have a kitten brain. One of my favorite things is going for walks. I have a leash and a harness and it makes my day to go for a little jog. I also like the car rides a lot..."
Read the rest of Monte's cute note of thanks and see his, and one of his humans, photo in "Testimonials". Oh, and by the way, Monte has been the star of several magazine ads. We are very proud of our boy! Several of our Cats have been featured in Nationally produced "Cat Calendars" as well.